On the most recent Kate Spade Surprise Sale, there were three backpacks available. Two were stripe, with a leather flap. And one was all leather. I didn’t buy it because it didn’t have a drawstring closure or another way to secure the pack before closing the flap. 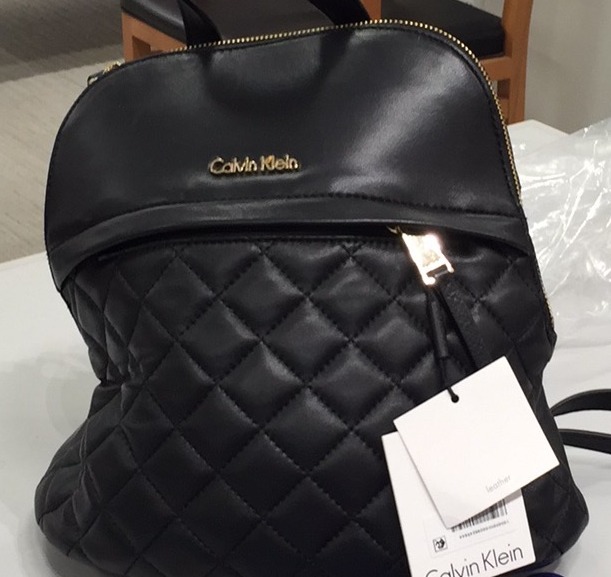 Instead, I decided to buy the Calvin Klein Chelsea lamb backpack ($268). I don’t always measure bags before I order and gauge the photos to decide what the size might look like. Smart, I know. As long as it’s not final sale and is easily returnable, I don’t mind disappointed if it’s not exactly as I expected. This bag was far too small, though. I also didn’t like the Calvin Klein nameplate, no offense to him. Here are others that I came across during my search. I weighed 2-3 of them for a few hours, but the Calvin Klein was the only one that made the cut. Of course now I’m like…uh, leather backpack, what? I’ll revisit the thought when fall merchandise rolls out. p.s. Check out a jeweled sandal sMacKdOwN here on 1060. Plus, Old Navy reviews on Gigi’s Gone Shopping. Ive in no way read anything like this before. So nice to locate somebody with some original thoughts on this subject, really thank you for beginning this up. this internet site is something which is essential on the web, someone with a small originality. valuable job for bringing some thing new to the world-wide-web! Just about all of what you articulate is astonishingly precise and it makes me ponder why I had not looked at this in this light before. Your piece truly did switch the light on for me as far as this specific subject goes. Nonetheless there is 1 factor I am not too comfortable with and while I make an effort to reconcile that with the actual core theme of your position, allow me observe just what the rest of the visitors have to point out.Well done. What i don’t realize is actually how you’re not really much more well-liked than you might be now. You are so intelligent. You realize therefore considerably relating to this subject, made me personally consider it from a lot of varied angles. Its like women and men aren’t fascinated unless it’s one thing to accomplish with Lady gaga! Your own stuffs excellent. Always maintain it up! I simply want to say I am just newbie to weblog and absolutely loved your blog. More than likely I’m going to bookmark your blog . You really have great articles. With thanks for revealing your website. I simply want to tell you that I am just newbie to blogging and actually savored this website. Likely I’m planning to bookmark your blog post . You really come with wonderful articles. Thanks for sharing with us your website page. I just want to say I’m very new to blogs and honestly loved this web site. Most likely I’m want to bookmark your blog post . You really have fabulous posts. Thank you for sharing with us your web page. I just want to mention I am just very new to blogging and site-building and seriously savored this blog. Likely I’m want to bookmark your site . You amazingly come with excellent article content. Appreciate it for sharing your web site. I simply want to tell you that I am just newbie to blogs and certainly savored you’re web site. Most likely I’m planning to bookmark your site . You absolutely have remarkable article content. Thank you for sharing your website page. I just want to say I’m new to weblog and honestly liked this blog. Very likely I’m going to bookmark your blog post . You surely have exceptional well written articles. Cheers for revealing your blog. I just want to mention I am just very new to blogging and site-building and absolutely savored this web site. Probably I’m planning to bookmark your website . You surely have impressive articles. Cheers for sharing your web page. Thank you for some other wonderful post. The place else could anybody get that kind of info in such a perfect approach of writing? I have a presentation subsequent week, and I am at the look for such information. I simply want to say I’m new to blogging and site-building and really loved your website. Almost certainly I’m likely to bookmark your blog . You absolutely come with great articles. Regards for sharing your web page. I simply want to say I am just all new to blogging and site-building and truly savored this web blog. Probably I’m want to bookmark your blog . You amazingly come with great article content. Thank you for sharing with us your website. I just added this kalysdi blog site to my rss reader, great stuff. Cannot get enough! whoah this weblog is wonderful i really like studying your articles. Keep up the good work! You understand, many persons are looking round for this info, you could aid them greatly. Throughout the great pattern of things you actually receive a B- with regard to effort. Exactly where you actually lost us was first on your details. As people say, details make or break the argument.. And it couldn’t be more accurate here. Having said that, permit me tell you exactly what did do the job. Your text is definitely highly convincing which is most likely why I am taking the effort to comment. I do not make it a regular habit of doing that. 2nd, despite the fact that I can see a leaps in reasoning you come up with, I am not necessarily sure of exactly how you seem to connect the ideas which produce the final result. For now I will subscribe to your issue however trust in the future you connect your dots better. I simply wanted to type a simple word in order to express gratitude to you for all of the superb guides you are sharing at this site. My extended internet look up has now been recognized with beneficial tips to exchange with my visitors. I would mention that we site visitors are undeniably lucky to live in a really good place with very many marvellous individuals with good tips and hints. I feel truly happy to have come across your web site and look forward to so many more enjoyable times reading here. Thanks once again for everything. I must express some appreciation to this writer just for rescuing me from this type of scenario. As a result of exploring through the internet and coming across strategies which were not powerful, I assumed my life was well over. Being alive devoid of the solutions to the problems you have fixed by means of your entire short article is a critical case, as well as ones which might have adversely affected my career if I hadn’t discovered your web site. Your primary understanding and kindness in maneuvering all areas was priceless. I don’t know what I would have done if I hadn’t discovered such a thing like this. It’s possible to at this point look forward to my future. Thanks a lot very much for your specialized and sensible guide. I will not hesitate to suggest the blog to anyone who would like direction on this matter. Usually I don’t learn article on blogs, however I wish to say that this write-up very forced me to take a look at and do it! Your writing style has been surprised me. Thank you, quite great article. Thanks for your entire efforts on this blog. My mom really likes going through internet research and it’s simple to grasp why. My spouse and i notice all relating to the powerful mode you give very important tips and tricks via this web blog and as well recommend contribution from website visitors on that subject and our own girl is being taught a whole lot. Have fun with the remaining portion of the new year. You’re the one conducting a first class job. Needed to put you a little bit of note to say thanks a lot as before just for the amazing strategies you’ve contributed in this article. It was certainly extremely open-handed with you to allow without restraint what a few people might have offered for an electronic book to end up making some bucks for their own end, especially considering the fact that you could possibly have done it if you ever desired. These things additionally served as the easy way to know that some people have the identical keenness the same as my own to know more regarding this condition. I’m certain there are some more pleasurable moments ahead for those who read carefully your website. Can I just say what a comfort to find someone that actually knows what they’re talking about over the internet. You actually realize how to bring an issue to light and make it important. A lot more people have to read this and understand this side of the story. I was surprised you’re not more popular given that you definitely possess the gift. Spot on with this write-up, I honestly think this site needs far more attention. I’ll probably be back again to read through more, thanks for the info! I used to be recommended this website via my cousin. I am not positive whether or not this put up is written via him as no one else realize such particular approximately my difficulty. You are amazing! Thank you! I am writing to make you understand of the brilliant discovery my wife’s daughter experienced reading your web page. She came to understand plenty of issues, not to mention what it’s like to possess a very effective helping character to let other folks completely know precisely various tortuous matters. You truly exceeded readers’ expected results. Thanks for presenting the effective, dependable, informative and in addition cool thoughts on your topic to Mary. Oh my goodness! Amazing article dude! Many thanks, However I am experiencing troubles with your RSS. I don’t understand why I can’t subscribe to it. Is there anybody else having identical RSS problems? Anyone who knows the answer will you kindly respond? Thanks!! I blog often and I genuinely thank you for your content. This great article has truly peaked my interest. I will take a note of your website and keep checking for new information about once a week. I subscribed to your Feed too. I am now not sure where you are getting your information, however great topic. I needs to spend a while studying much more or figuring out more. Thanks for wonderful information I was in search of this info for my mission. Hi, I do believe your web site might be having web browser compatibility problems. Whenever I look at your website in Safari, it looks fine but when opening in I.E., it’s got some overlapping issues. I just wanted to give you a quick heads up! Aside from that, wonderful blog! Having read this I believed it was rather informative. I appreciate you taking the time and effort to put this information together. I once again find myself personally spending a lot of time both reading and commenting. But so what, it was still worth it! Hey very cool web site!! Guy .. Excellent .. Wonderful .. I will bookmark your site and take the feeds also…I am happy to find a lot of useful info right here within the submit, we need develop more techniques in this regard, thanks for sharing. An interesting discussion is definitely worth comment. There’s no doubt that that you ought to publish more on this subject matter, it might not be a taboo matter but typically people do not talk about these issues. To the next! Kind regards! !